Air freight Rotterdam - Mainport Warehousing B.V.
Special air freight is transported by your trusted partner at the port of Rotterdam. Mainport is a globally operating company that specializes in the transport and warehousing of marine spare parts. This includes door to ship delivery, transporting heavy and oversized cargo, and packing and repacking services. Contact Mainport for more information about the possibilities for air freight from Rotterdam to your desired location anywhere in the world. One of the most important services that Mainport has to offer is the timely delivery of spare parts to your vessels, exactly when and where you need them. One phone call is enough. 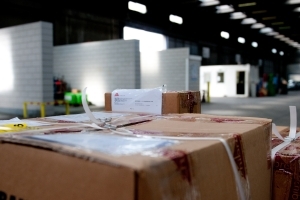 Our professionals will immediately retrieve the necessary parts from our warehouse in Rotterdam, package them, and deliver them at the requested port. This service is available 24/7, so you will always get the right parts exactly when you need them. Inquire about the details of this service by calling Mainport at +31 (0)10 495 4360.